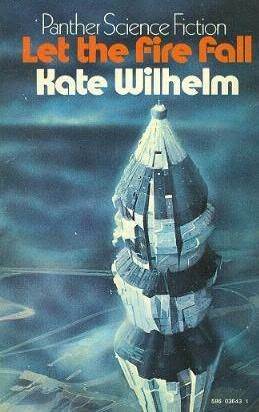 I really liked the last Kate Wilhelm novel I read (Where Late the Sweet Birds Sang), for her tight plotting, her compelling storytelling, her inventiveness with imagining the future. But I was impatient (perhaps I shouldn’t have been: she’s an author of her times) with the annoying contrasts between the broad dystopic vision cramped into a small area of the north-east of the USA, as if no other society existed, and the way she could imagine future sexualities but totally ignore the implications of how the women’s equality that was already emerging in her own time could make society change. Let The Fire Fall (1972) is very much in the same pattern: a terrific initiating cataclysmic event (alien ship full of pregnant mothers crashes into cornfield: will anyone survive? 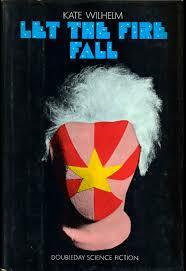 ), some plausible, well-integrated futuristic inventions (hand-held anti-gravity devices, video phones), and a well-thought-out plot (the no-good local lothario turns evil evangelist for personal gain, develops America-wide religious cult for social control with the antagonistic help of the local girl who won’t let him go, and the corrupt psychologist). This is all good, as is the good doctor who swops (or does he?) the babies, so that the last surviving alien baby is actually brought up as his own scruffy son, while the illegitimate son of the lothario, born seconds earlier, is brought up under the care of the UN as a scientific wonder and curiosity. The main plot is classic good son versus bad son, and we root like mad for the survival strategies of the good son who is perpetually on the run once the evil evangelist kidnaps him for co-Messiah duties. The story of the hunted man is as old as the hills (Samson and Delilah, anyone?) and always compelling: those moments are the most successful parts of the novel. The hunted boy / man has special qualities that help him learn faster, create more, blend in and be generally smarter than anyone else around him, so that’s very satisfying to read. He’s also a warm, loving, friendly, reliable hero: how could this go wrong? The science fiction parts are less interesting because Wilhelm doesn’t actually do anything with them. Her focus is the manipulation of a future society by bad men (and one bad woman) and clever technology, so as a dystopic nightmare the sf label fits. But the alien spaceship may as well have exploded after landing for all the use it has in the plot. The title comes from 1 Kings 18:38, when the fire of God fell from heaven to devour the sacrifice prepared by Elijah. If you think that the alien ship, falling from heaven, contains the alien fire of the boy Johnny, perhaps that makes sense. 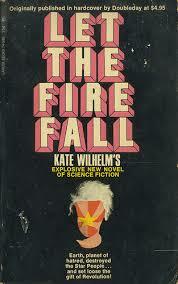 It’s another tortuous title from Wilhelm, following the example of James Tiptree Jnr. I can see what she’s doing, but think that she could have done more.